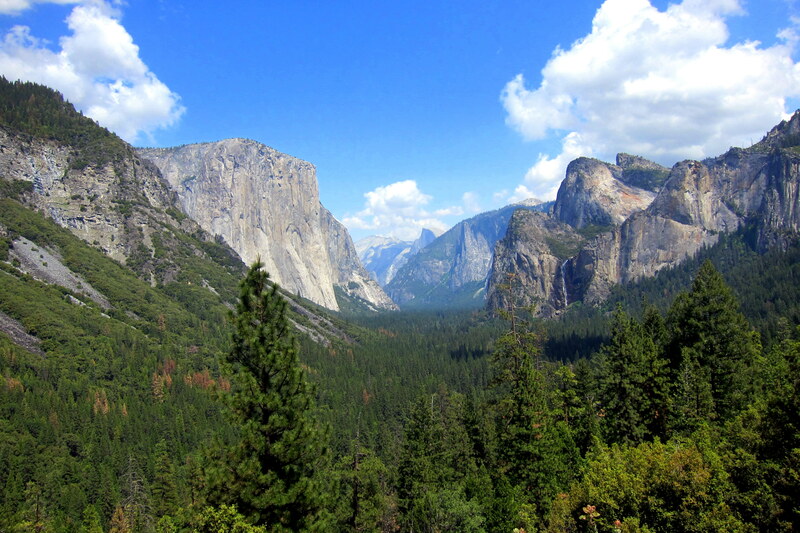 Tuesday, May 5 and Wednesday, May 6, 2015: Groveland, California: Today and tomorrow, we are going to explore one of the finest National Parks in America…..Yosemite! This is exciting as Kit and I have been trying to get here for the past few years! Even though Yosemite is open year round, many roads are impassable at this altitude during the winter months…..and, when the road is safe, we are usually heading back home. On a few occasions when the weather had moderated and we were within striking distance of the park, fate found us to the east of the Sierra Nevada Mountain Range. Then the only way up and over those lofty peaks was by way of the CA-120W over the 9,945 foot Tioga Pass……however that route to Yosemite’s east entrance is treacherous while towing an RV due to lingering snow and ice! This is the year! 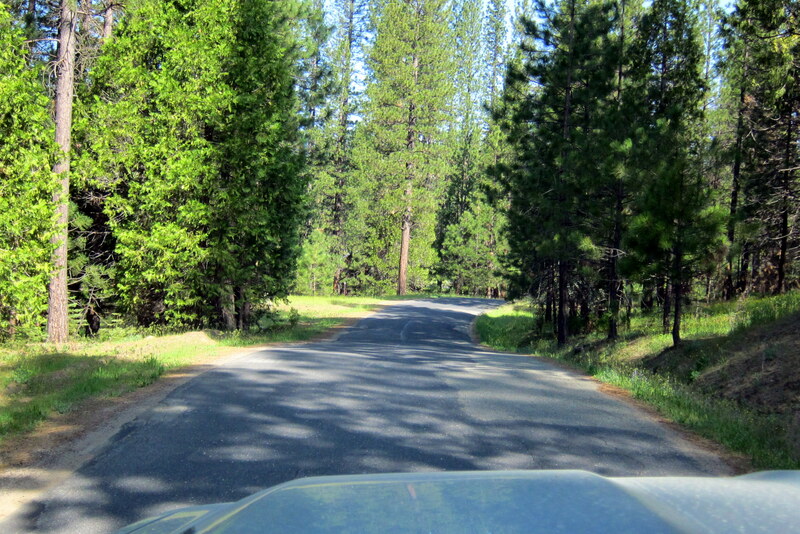 With the trailer safely parked at Yosemite Lakes Campground, Kit and I make our way into the park by way of CA-120 East. Shortly after passing through the Big Oak Flat entrance gate we stopped to take the obligatory “we’re finally here” photo. Then threading our way down the steep twisty road and entering the valley, our first stop was at Bridal Veil Falls. A short walk took us near this amazing 620 foot waterfall plunging into the valley. 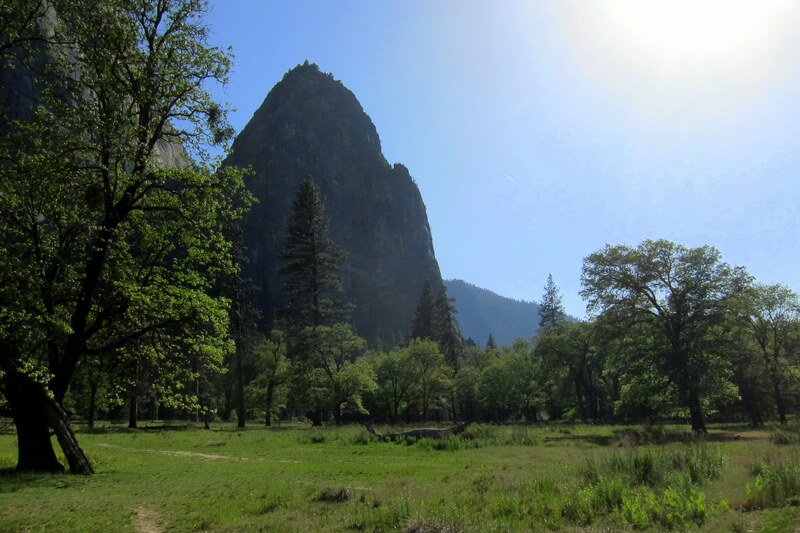 Continuing on the Park Road, Kit and I decided that Yosemite Valley was better observed on foot. 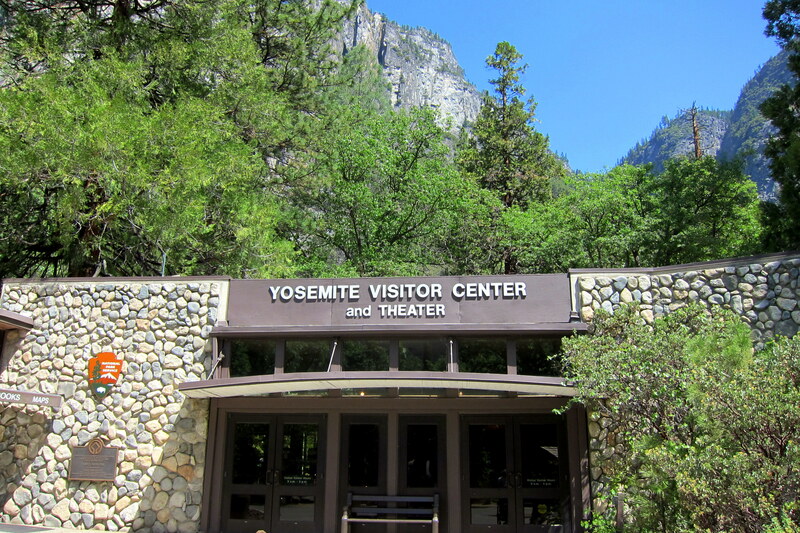 So we located parking in Yosemite Village which will give us access to many of the natural sights as well as the museums, shops, galleries, and the NPS visitor’s center…..which is where we headed first. 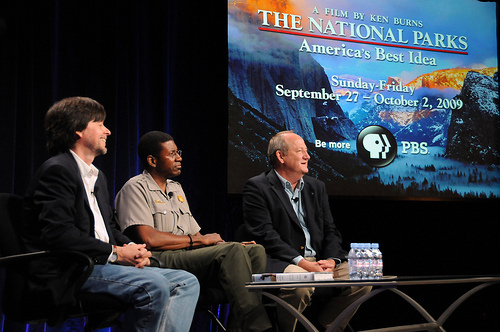 Kit and I arrived just in time to view a great film about Yosemite, most of which was taken from Ken Burns documentary: “The National Parks; Americas Best Idea”…..a PBS special that if you haven’t enjoyed, I strongly urge you to do so! Leaving the theater, Kit walked to the gift shop and I headed to the rangers desk to get maps and information……and that’s when I spotted this fellow. 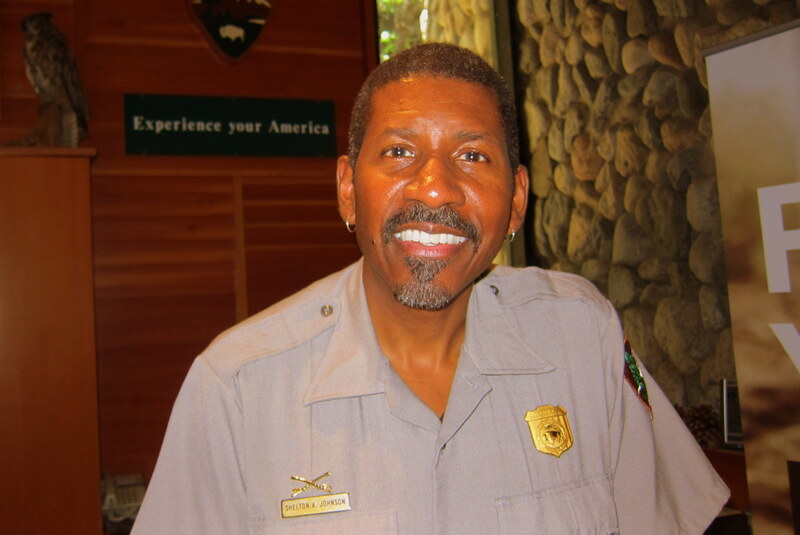 His name is Shelton Johnson and he has been a National Park Ranger for 28 years. Shelton was profiled in the short film we just viewed as well as the 12 hour Ken Burns documentary which premiered on Public Broadcasting Station’s in September of 2009. Ranger Johnson spent quite a while visiting with me, talking about his time with the park service, and his instant notoriety after the documentary was aired. He had a number of interesting stories about working with the film crew as well as Ken Burns. 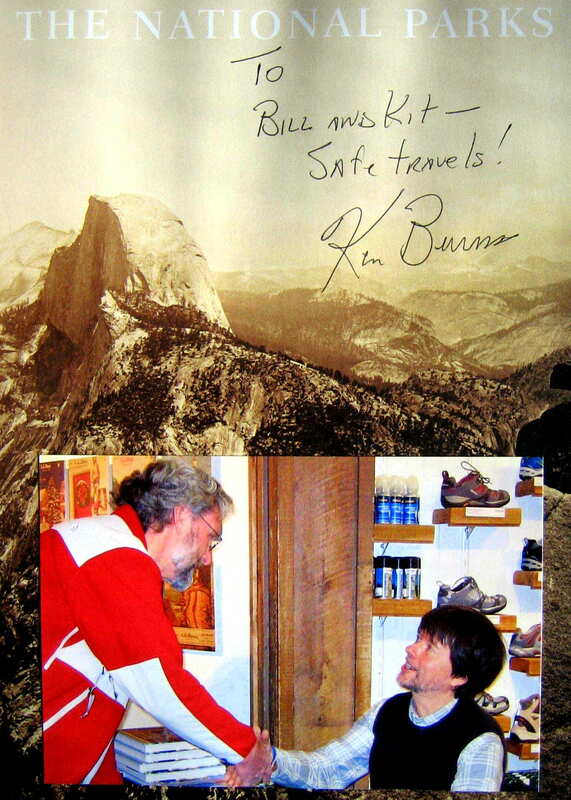 I had mentioned that I had the pleasure of meeting Mr. Burns at a book signing back in December of 2009 just as Kit and I were about to embark on our second Excellent Adventure journey. I also found him friendly and engaging. 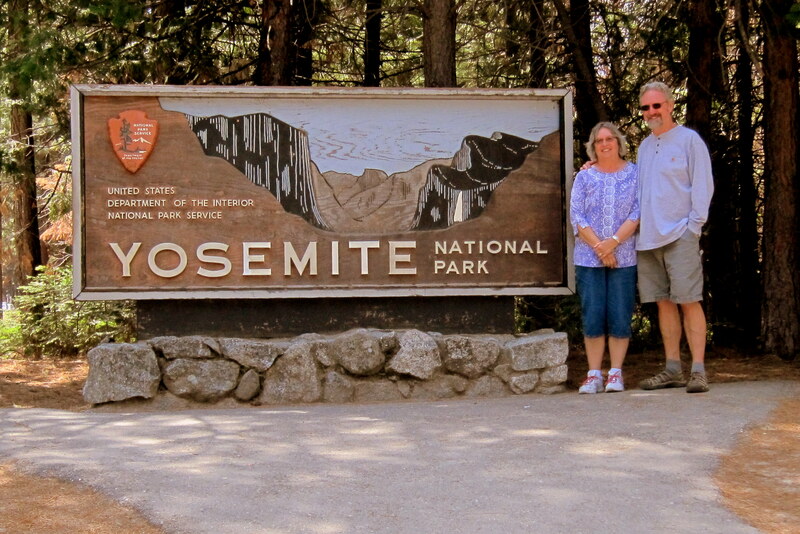 Upon hearing of our travels, I was surprised that Ken spent a considerable amount of time giving me information on his favorite National Parks……one of which was Yosemite! Before leaving the visitors center, I learned that Ranger Johnson had never visited Acadia National Park but wanted to in the near future. I handed him one of our cards and invited him to stay with us if he should ever make it to Maine…..hope he takes us up on it! 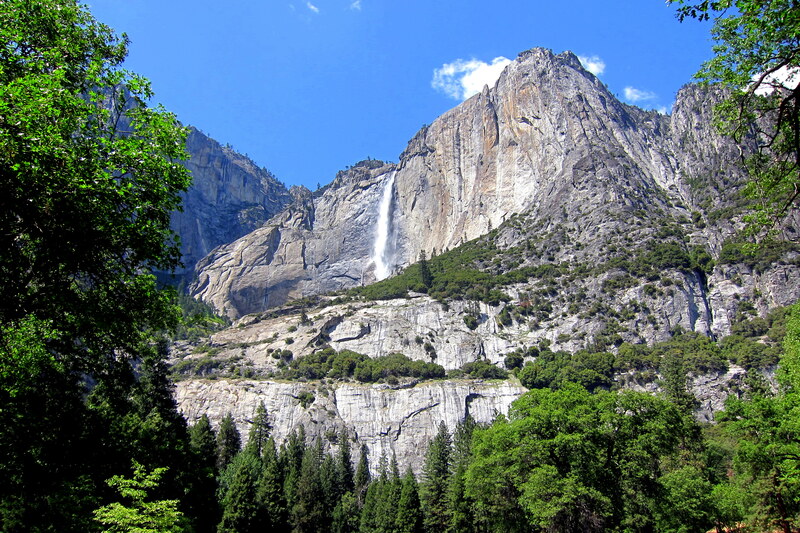 Stepping outside, Kit and I went our separate ways…..she to look through the many shops in the village, and I to walk a trail that led to another of the many waterfalls that pour snowmelt into the valley……Yosemite Falls. The roar of the falling water coupled with the cool mist made for an exhilarating and refreshing pause on this warm morning. Heading back down, I looped about the valley floor while enjoying the sun filled meadow. Ringed by huge blocks of solid granite. 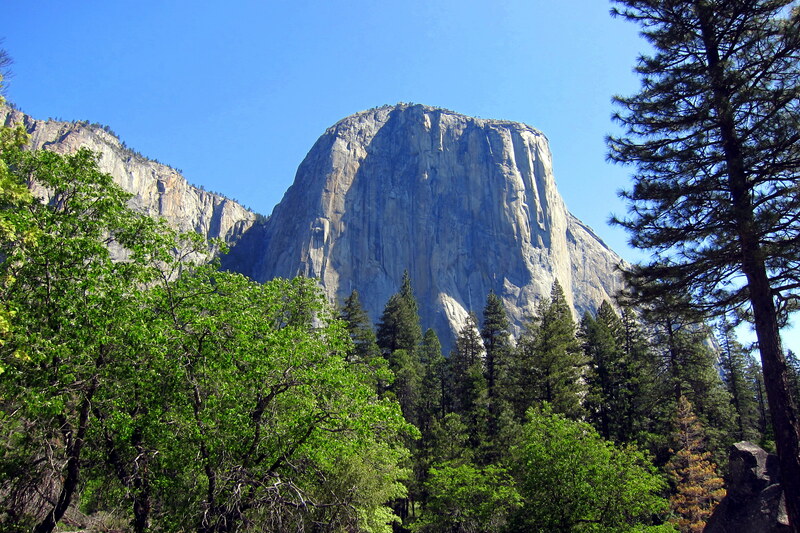 Including El Capitan, a world class sport climbing venue. After a few hours, I meandered back to the visitor’s center, where I met Kit for a picnic lunch. We ate while sitting on a park bench enjoying more of the incredible views Yosemite has to offer. 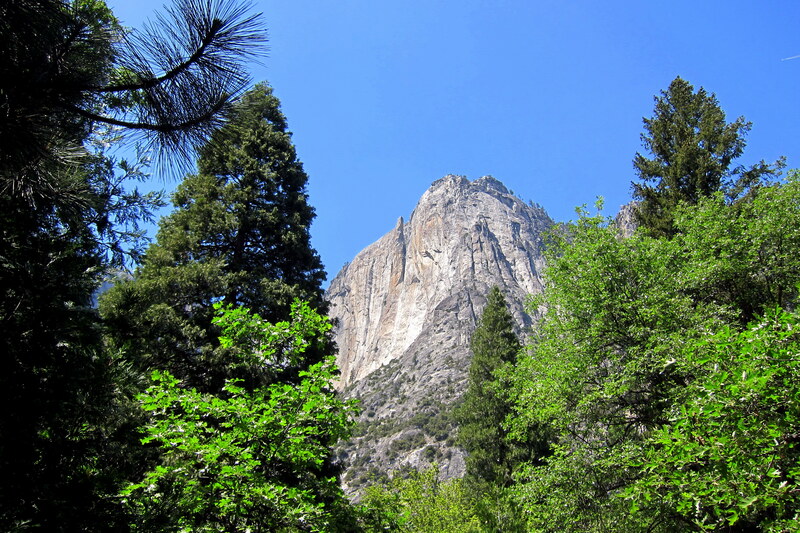 …..while enjoying more of the incredible granite temples that surround Yosemite Valley. It was an absolutely fantastic day in an utterly fantastic natural wonder. 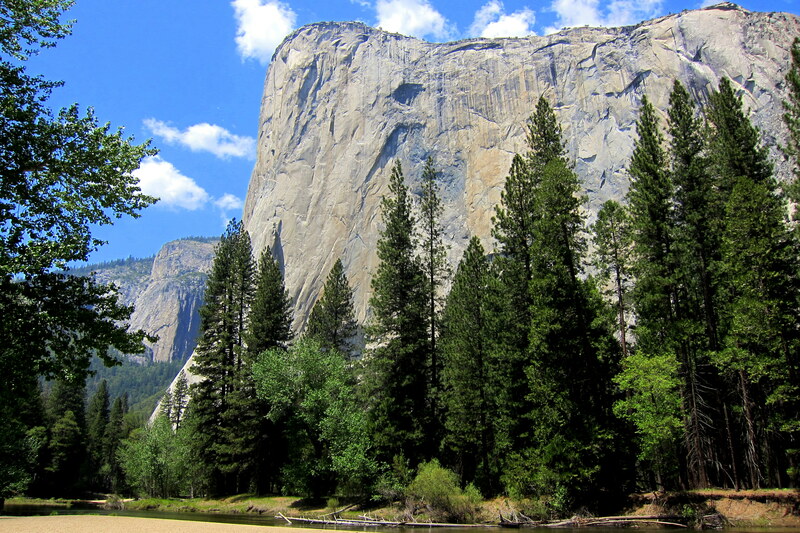 Yosemite is now firmly entrenched in my personal list of top five National Parks! And that’s considering that, to date, we have enjoyed 23 out of the 59 parks in the system! On day two, Kit and I left our campsite and once again headed toward Yosemite. This time to explore other, seldom visited areas of the park. 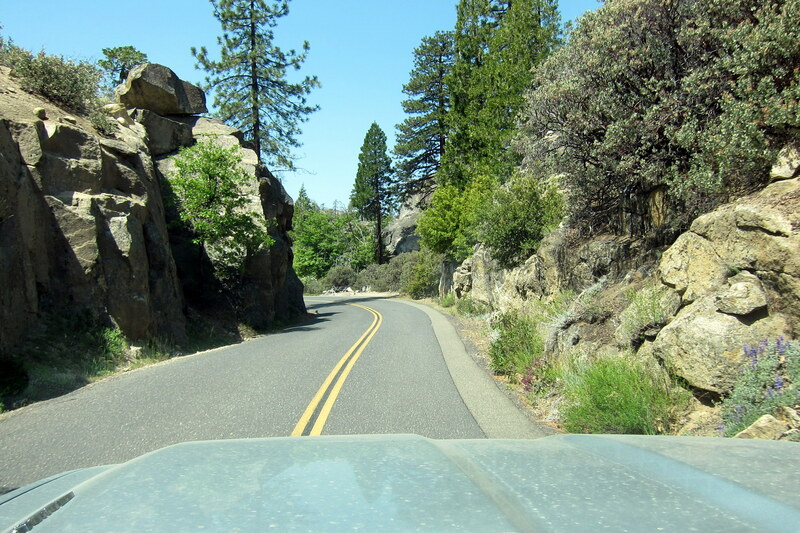 Turning onto Evergreen Road, we made our way through the Poopenaut (no comment) Valley towards Yosemite’s lost sister, Hetch Hetchy……another of naturalists John Muir’s favorite wild places. 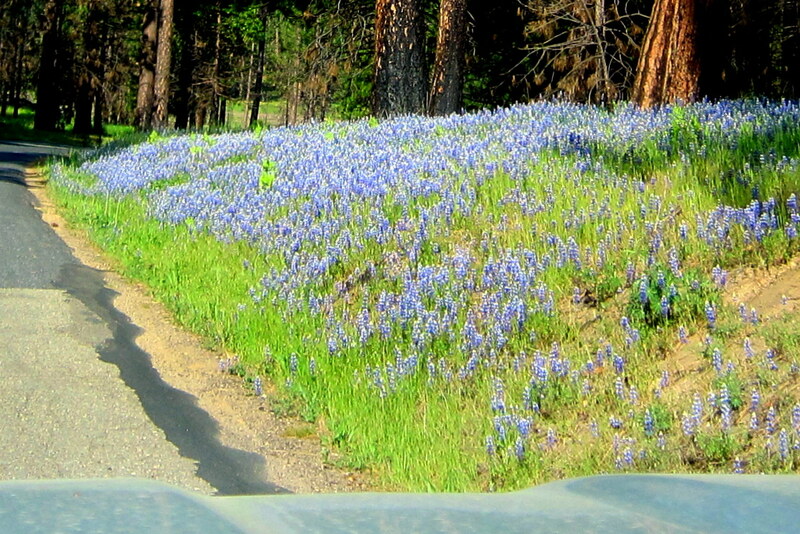 Driving along the mountain path, we were greeted by acres of blooming Lupines. 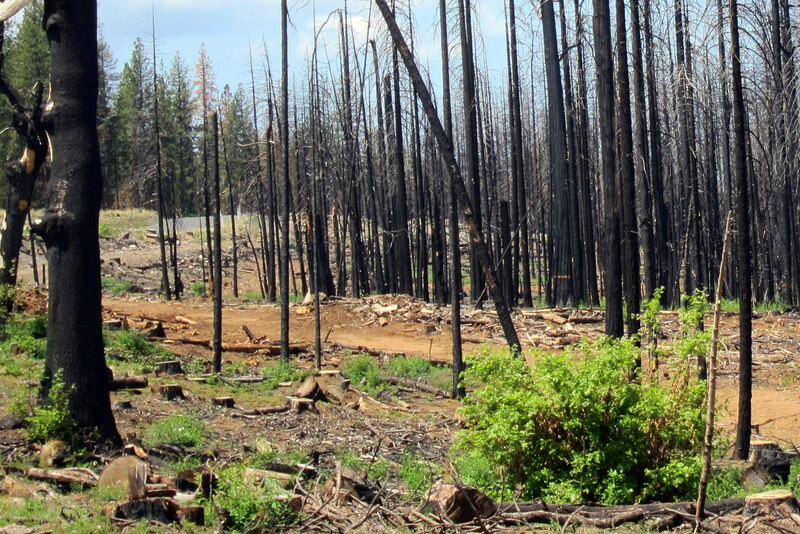 And the residual scars from the 2013 Rim Fire that burned 257,314 acres and also threatened the National Park before being brought under control. Foresters now know that wildfires are good for the environment in that they clear thick underbrush and create perfect conditions for tree seed to germinate and grow. 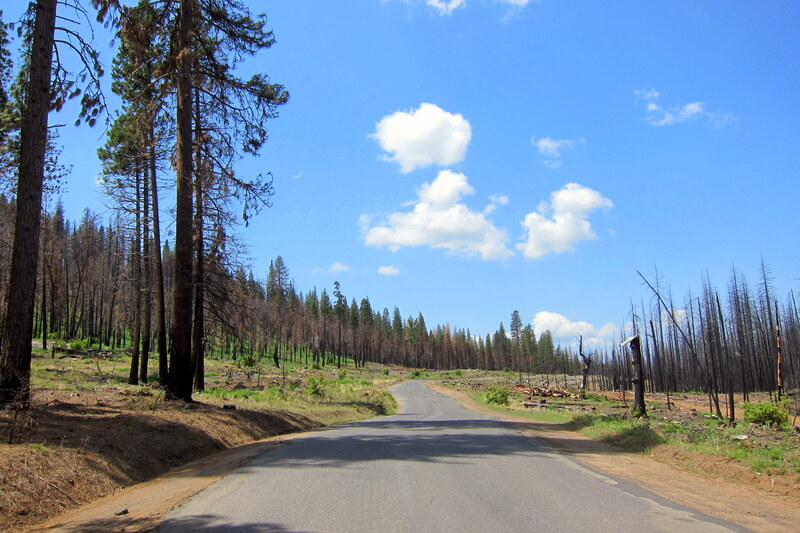 In addition, Mother Nature can quickly begin to heal the affect from forest fires. 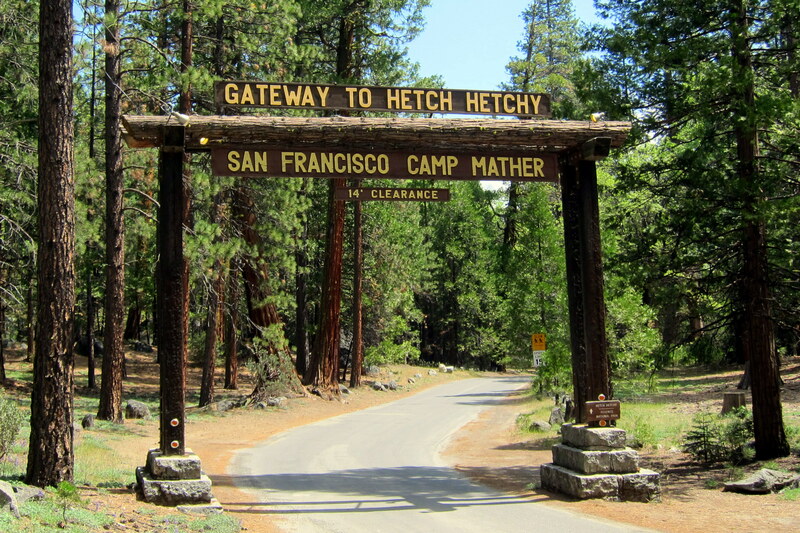 At the small mountain enclave of Mather, we turned off on Hetch Hetchy Road and made our way through the entrance gate. After winding through Pine and Sequoia woodlands, the beautiful Hetch Hetchy Valley came into view. Yep, it’s somewhere under all that water…..still beautiful in its own way, however! So, how did this pristine valley within our National Park become submerged? Well, by the hand of man of course! 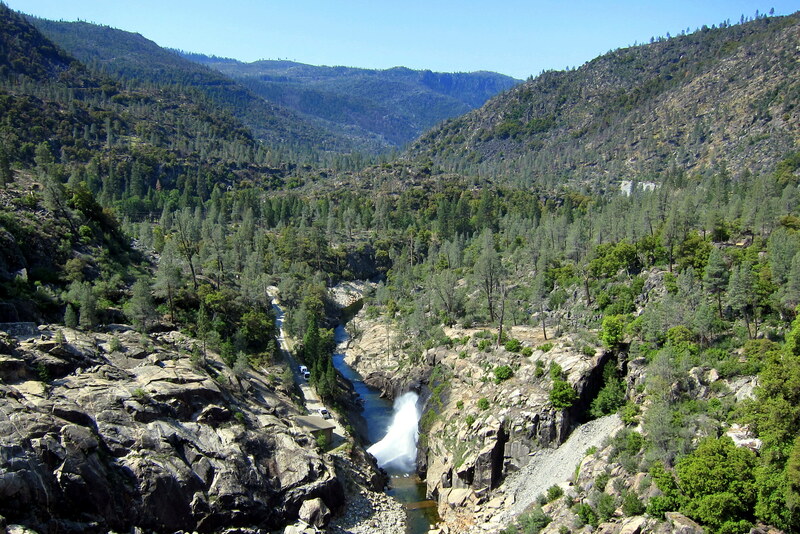 An extremely controversial water project resulted in the building of the O’Shaughnessy dam (or as John Muir spelled it “damn”) and the resultant impounding of the Tuolumne River. The driving force behind this project was the San Francisco earthquake and fire of 1906. Following that disaster, there was a demonstrated need for a more reliable water source for the city. After years of political finagling, the US Department of the Interior gave the city of San Francisco water rights to the Tuolumne…..much to the displeasure of The National Park Service, environmentalists, and towns nearby that felt they should have rights to this natural resource. 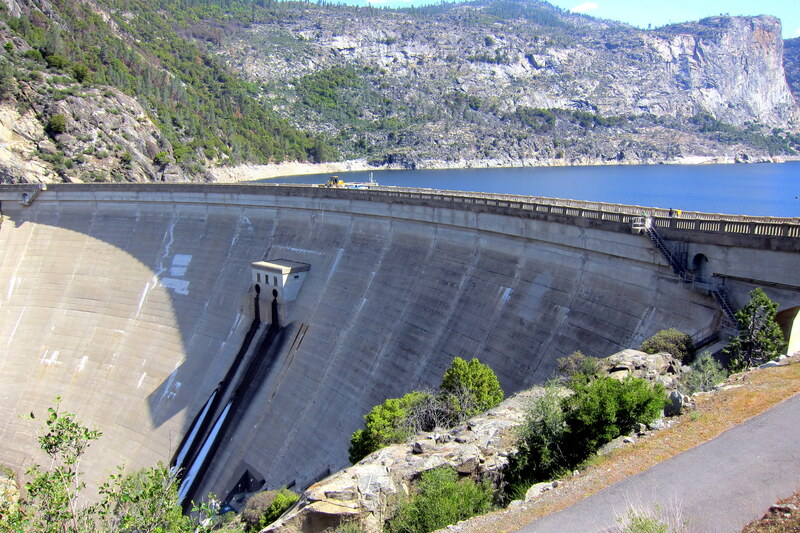 The need for the project has been debated ever since and there is a real push by The Sierra Club to remove the O’Shaughnessy Dam and allow nature to restore Hetch Hetchy Valley to its natural state. Time will tell if that ever happens! The Tuolumne River still flows however, albeit a trickle of its former self. 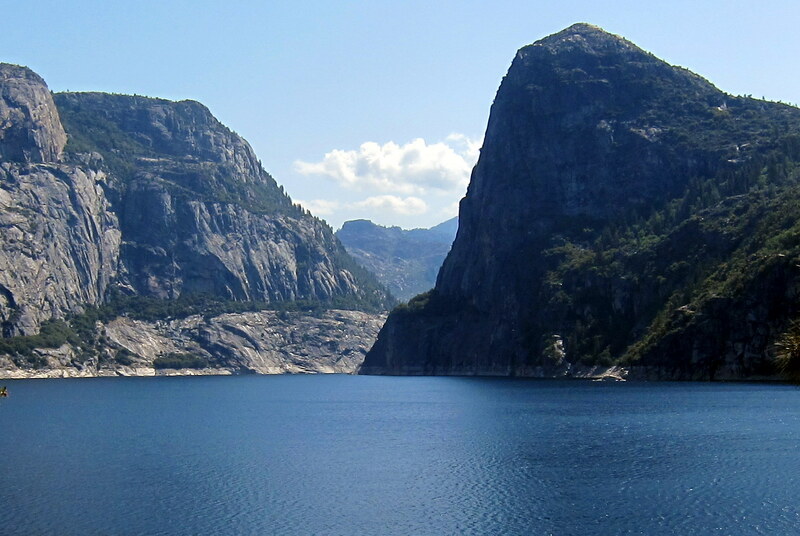 The Hetch Hetchy Reservoir, impounded in 1938, provides pure mountain water to 2.4 million San Francisco folks over 160 miles to the west, and this is done entirely by gravity. In addition, it generates hydroelectric power to municipalities in the area including Sequoia National Park. 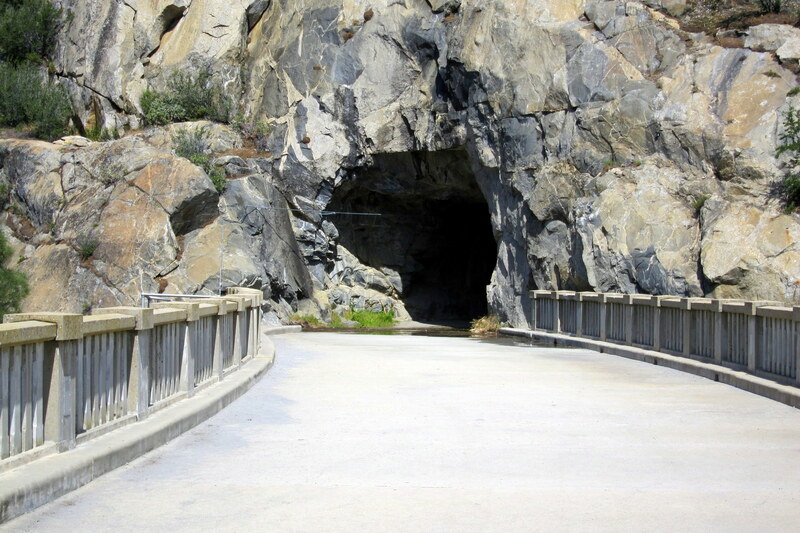 At the north end of the dam, there is a tunnel bored through the granite that allows access to a system of trails. 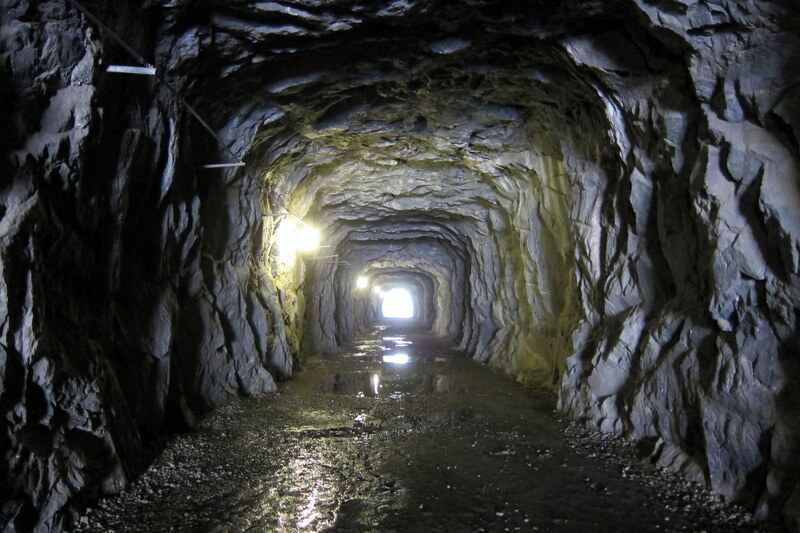 The tunnel, originally built as a railroad pass is wet, dark, dank and spooky! It was at this point that Kit decided she had seen enough and headed back to the truck. Exiting the tunnel brought a different visual perspective of the reservoir. But the real treat is to see what remains of Hetch Hetchy Valley with its steeply sloped granite plunging into the water. 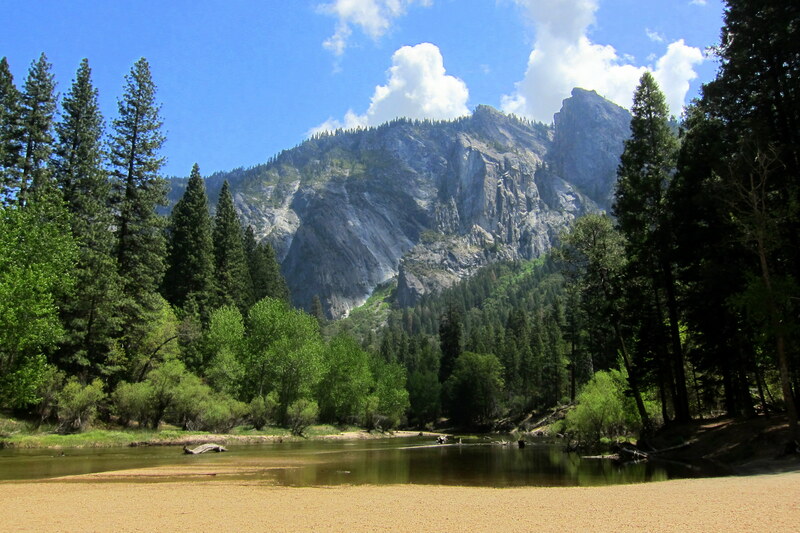 I stood for a while and tried to visualize what this valley might have looked like before being drowned…..I bet it was every bit as incredible as Yosemite! Up until the early 1900, Americans viewed wilderness as something to conquer and that natural resources were infinite. Shortly after the dam was built, citizens started to appreciate our wild lands and began to lobby politicians for their protection. 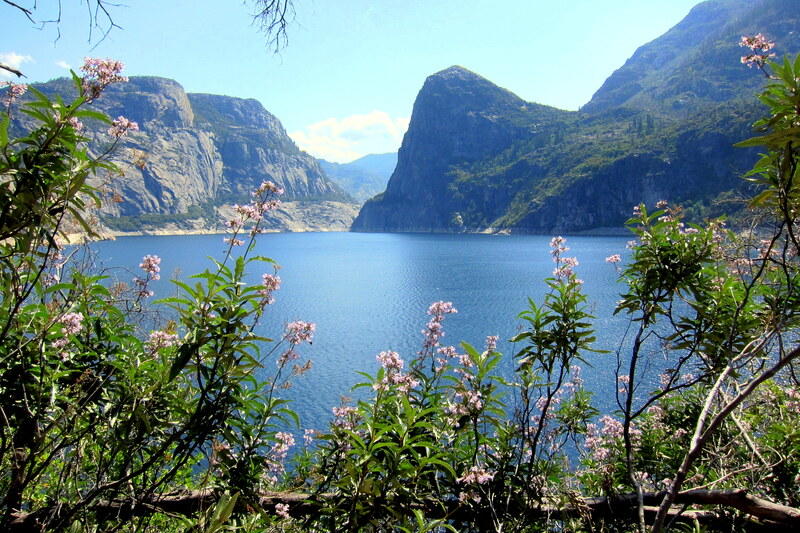 That is Hetch Hetchy’s legacy, as well as John Muir’s…..he may have lost the battle, but he eventually started winning the war! This one relatively small valley in the mountains of California may be the best example of the difficulty of balancing what is best for man versus what is best for mankind. Back on the road, Kit and I decided to spend the afternoon driving the long slow steep winding road up to Glacier Point. 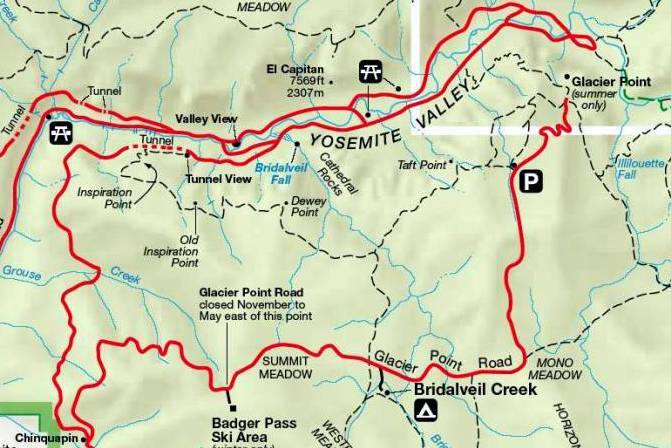 Notice the squiggly line on the map below and Glacier Point in the upper right-hand corner. Now imagine that squiggly line gaining altitude rapidly by way of extreme hairpin turns and little protection in the way of guard rails. Fortunately, there are plenty of turn outs to pull over and safely enjoy the views of the emerging valley. When it isn’t possible to go around the mountain, the road engineers just bored through it. Glacier Point summit is 3,214 feet above the valley floor, and provides the best view of the entire valley of Yosemite that one can enjoy without being a bird. 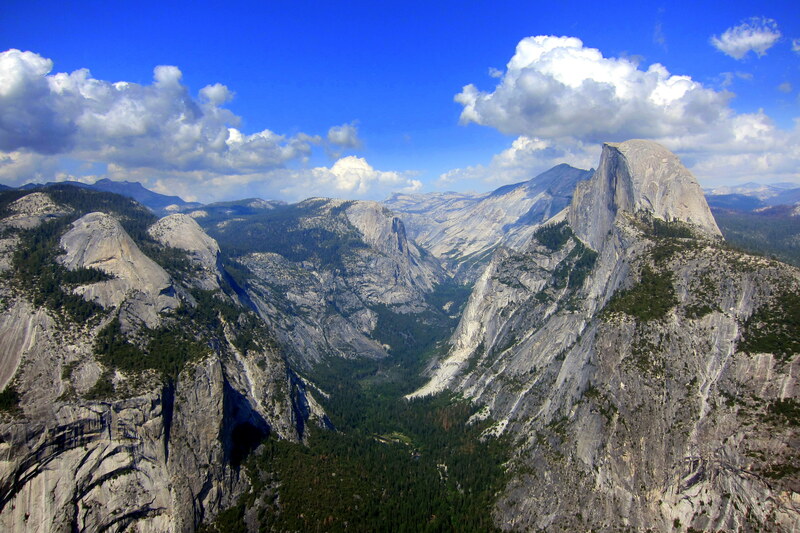 It seems as if everyone knows of Half Dome as it is featured in many Yosemite photos as well as NPS brochures. 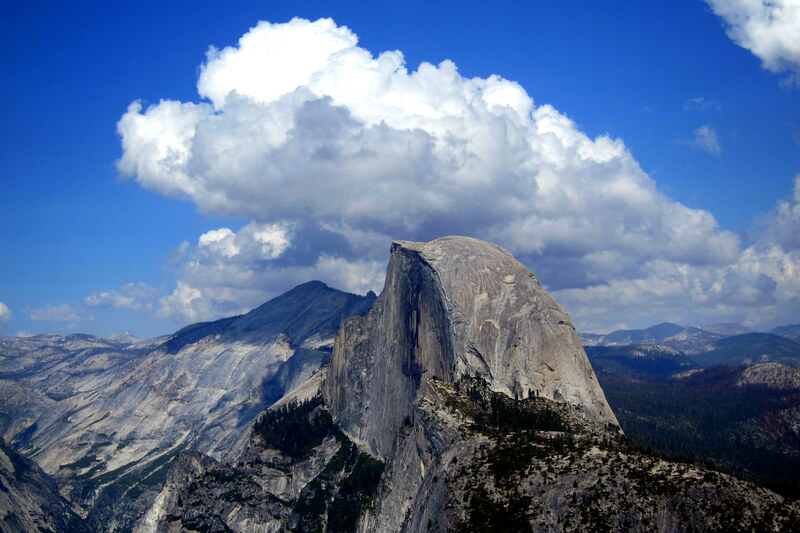 However most folks do not know that Half Dome isn’t half of anything…..it’s just a geological optical illusion. The opposite side from where people in the valley view Half Dome is nearly as steep. It is actually a thin ridge of rock known as an arête. 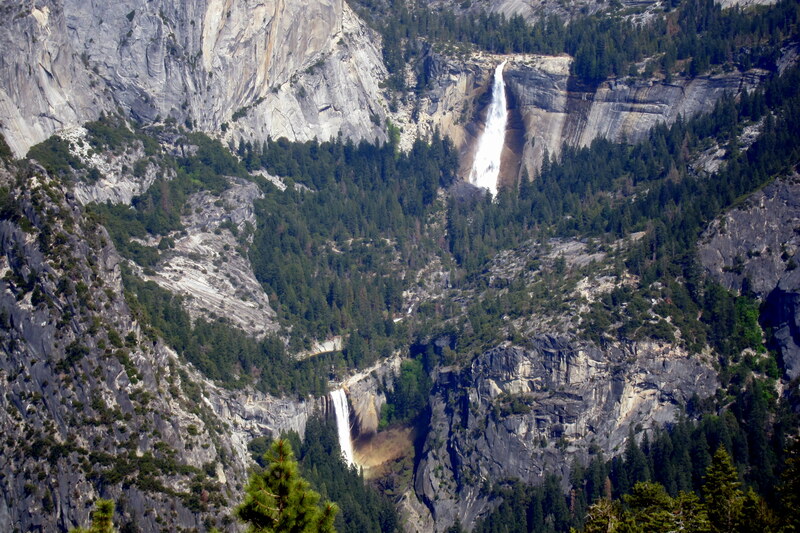 From this vantage point, one can also view many of the waterfalls that plunge into the valley, such as Upper and Lower Yosemite Falls. 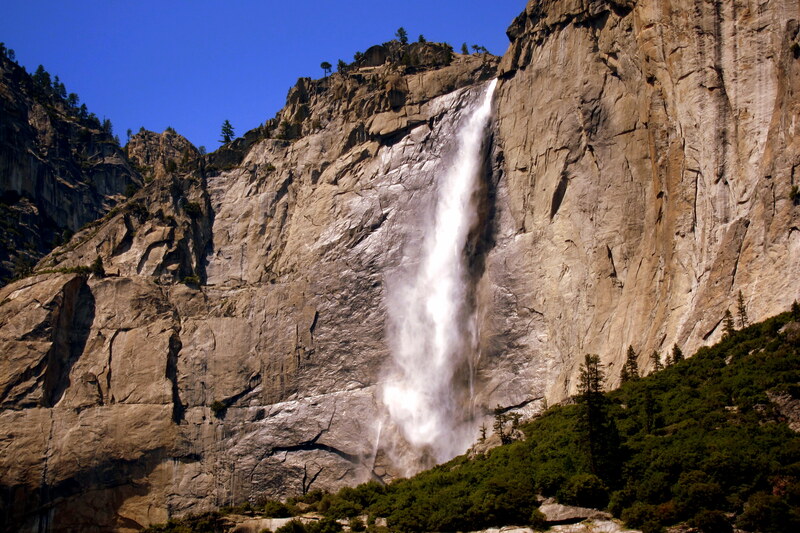 As well as Nevada and Vernal Falls along with many other natural wonders that makes this place so special. I would have liked to stay atop Glacier Point until after sunset, but the thought of negotiating that road after dark concerned me….and Kit. So, as we slowly drove back down the long slow steep winding road, Kit had a white knuckle grip on anything within her reach……fortunately I kept my neck out of that reach! 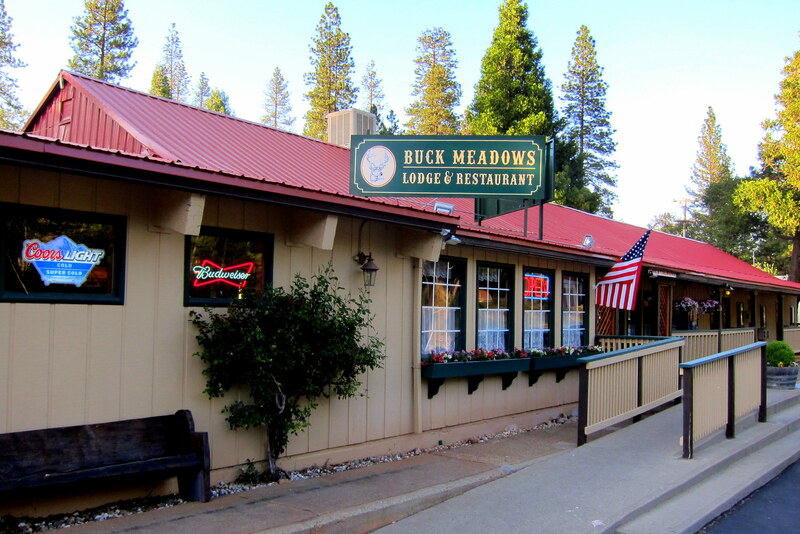 As a thank you for enduring the trip to the heavens, I took Kit to a local institution for dinner…..The Buck Meadows Lodge. 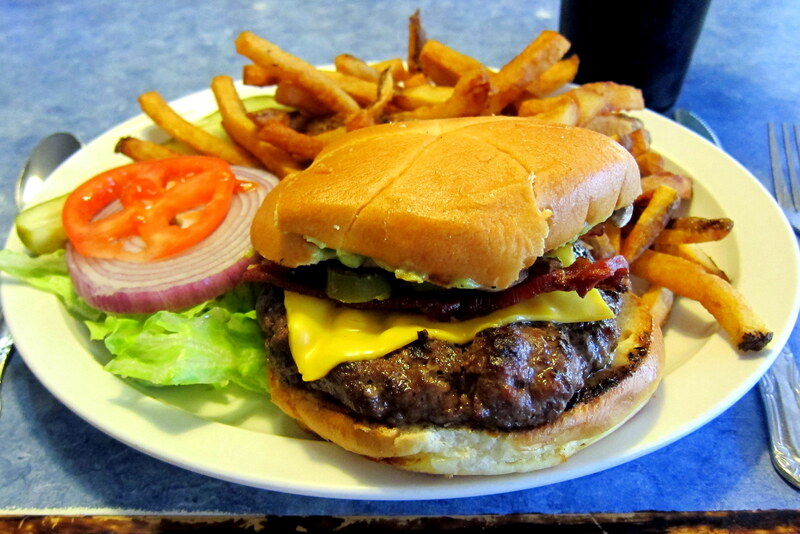 A couple of local brews and some Bison Burgers with bacon and avocado helped make amends. Thursday, May 7, 2015: Dawn broke cool and cloudy with the threat of rain. As I prepped the rig for departure, I noticed some snagged foliage hanging off the roof rack. 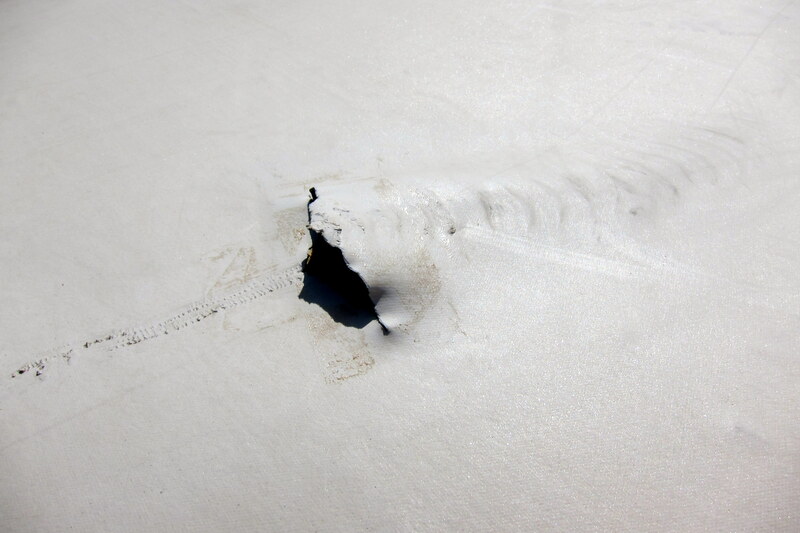 Climbing the ladder to remove the stowaway, I noticed this tear in the EPDM. Remember that picturesque Live Oak Tree in Cathay Valley we parked under for a picnic a few days ago? Well, apparently it had a dark side and reached down to snag my roof as I pulled away. I was a bit bummed…..after all; this camper is only four months old. My last rig made it past the first year before I was able to cause this level of damage! I comforted myself by the thought that if we just sat all winter in an RV park, then the camper would be isolated from the rigors of travel…..however, we don’t, and it ain’t! Oh well, such is life on the road! EPDM is a rubberized roof material used on most RV’s today. It is light, impervious to moisture, and relatively easy to apply and repair. I thought of waiting till our next stop to make repairs but with the threat of rain, I broke out the famous Yankee Tool Product…..Duct Tape! 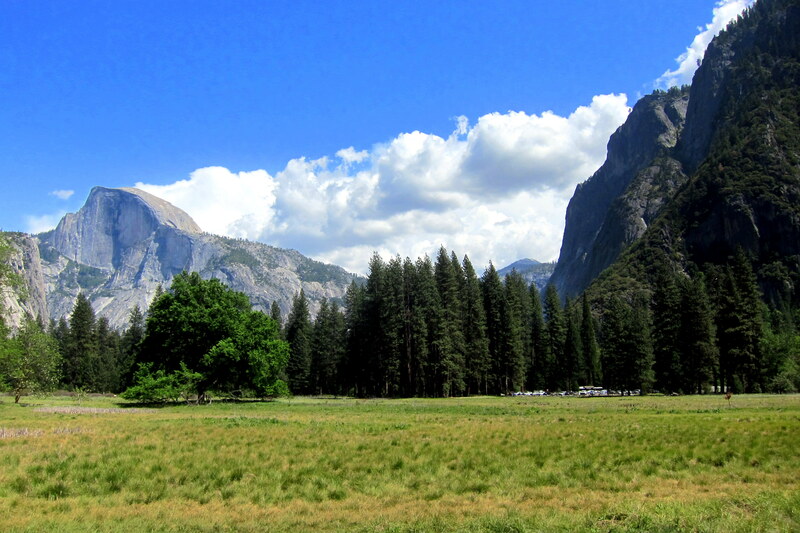 Kit’s Bit’s: Yosemite NP was so incredibly beautiful! I was so glad to finally see it and explore most of it. It always seemed a little weird to me when people asked if we’d been there after learning we were from California and I said “no, we haven’t been there yet”. It’s been so nice to finally explore these places we’ve always wondered about. Our self-proclaimed “home state” (neither of us was born there), has so many magnificent places to visit and so much beauty; it’s wonderful to finally have the opportunity to see a lot of it. Wow, great pictures and waterfalls, waterfalls, waterfalls!!! But Bill, Hetch Hetchy…..you made that up right??!! Nope, it’s an actual place! However it does sound like something I would make up! Looking forward to seeing you folks when we return to Maine! Thanks for the nice comment. We really enjoyed visiting with you folks a few weeks back. Please remember if you make it out to the east coast, look us up! SUPER SPECTACULAR PARK. ALMOST BEYOND BELIEF THAT THE FEDERAL GOVERMENT CAN KEEP DEVELOPERS PAWS OFF FROM ONE OF MOTHER NATURES GREATEST TREASURES. WINDY AND NAN INVITED US OVER FOR DINNER, YUMMY PORK ROAST AND A NICE GLASS OF VINO. RAINING HERE TODAY, WE SURE DO NEED IT!! I GUESS I FORGOT TO TELL YA THAT JEANNE FELL HERE AT HOME AND DISLOCATED AND BROKE A BONE IN HER LEFT SHOULDER. OPTED TO SKIP THE KNIFE, WILL HOPE IT HEALS NATURALLY IN 6/8 WEEKS. 50/50 SHOT. Ouch! Hope Jeannie is on the mend. Please give her our best for a speedy recovery. Breathtaking views! Nice you could visit without the crowds, too. This year’s traveling certainly should be the highlight of all the ones you have done, so far. BTW, it is safe to return home–our summer is here. Thanks for the nice comment. We are slowly meandering our way east…..please don’t let summer end before we get there! Awesome pictures….love your blog, travel safe you guys hope to see you soon….tomorrow June 1st….. Thanks Marcelle, we look forward to seeing you out at the lake very soon! 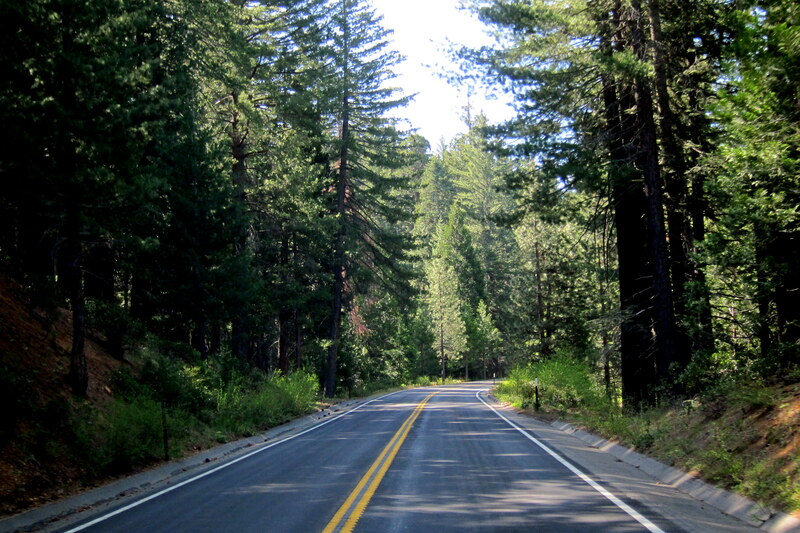 To me, the Yosemite, Sequoia-Kings Canyons and the Mammoth area are the most beautiful areas in California! I would live there if I could afford it! I am so happy you have seen the three of my four favorites! 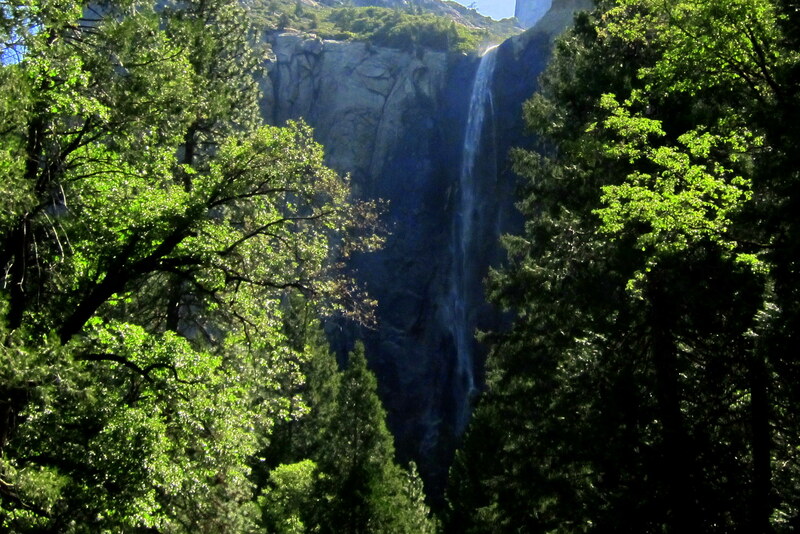 We agree, the Sierra Nevada’s are one of the great natural areas in our country. We intend to return soon to explore the area some more. Boy, that was a wonderful tour of Yosemite! The first time we viewed that park, was on our honeymoon (nearly 57 years ago! )…Your photography is excellent, Bill…and I admire your patience, Kit! Keep on truckin’! We will, and you do the same! Thanks for the nice compliment and for allowing us to dooryard surf at you place in Oregon. I have got to see Yosemite. What a beautiful place….thank you for bringing it alive for me in words and pictures. 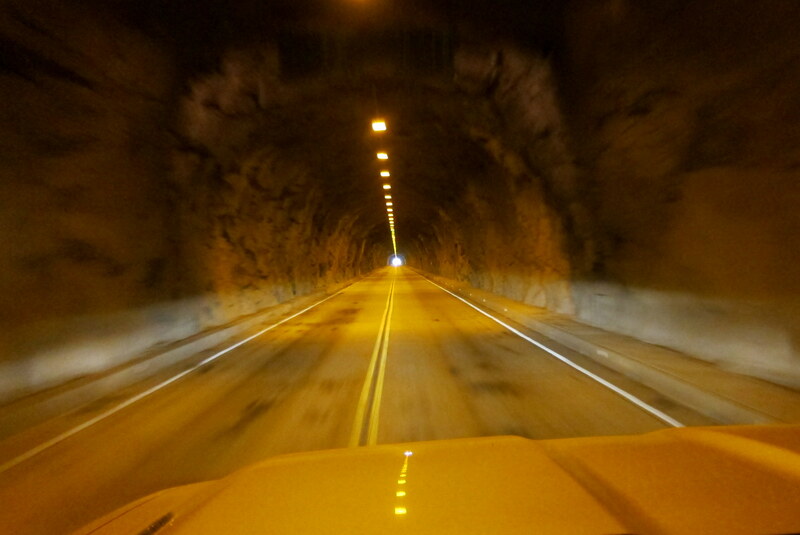 I’m glad you didn’t encounter any bears….that tunnel was scary enough! It is an incredible place, as well as many other National Parks in our country. Thank you for the nice comment, hope to see you in a square soon! At first glance of the last picture I thought you were providing us with a Ansel Adams picture of a leaf leaving ripples on a pool of water or something, but reading the paragraph realized it was you camper. Bummer. Funny, and appropriate. I love Ansel Adams photography…..it is amazing what he could do with black, white, and all the gray scales! We are slowly meandering our way home via the northern route, so unfortunately will not be rolling through Pennsylvania this year. Please tell the family we are well and miss them all. Bill and KIt, while you had a Grand Lady before you photographically, THIS is the very best photographic blog ever! THANK YOU, Bill, for sharing the Grand Canyon in all its glory with us through your special camera lens and your “photographic eye” for beauty! Love you guys!! Thank you Nancy, for the very nice compliment. Stay well and please take care of each other…..hope to see you again on our next trip through central California! Bill – you have out done yourself with the pictures in this bog posting. I continue to love peeking into a way of life I can only imagine. Keep up the good work. Thanks for the very kind comment…..coming from an accomplished photographer such as yourself means a lot! Sorry we missed you in Maine, hope to see you and Betty at some point before the end of the year. Stay well my friend. Thanks for reminding me that it is time to visit Yosemite again. 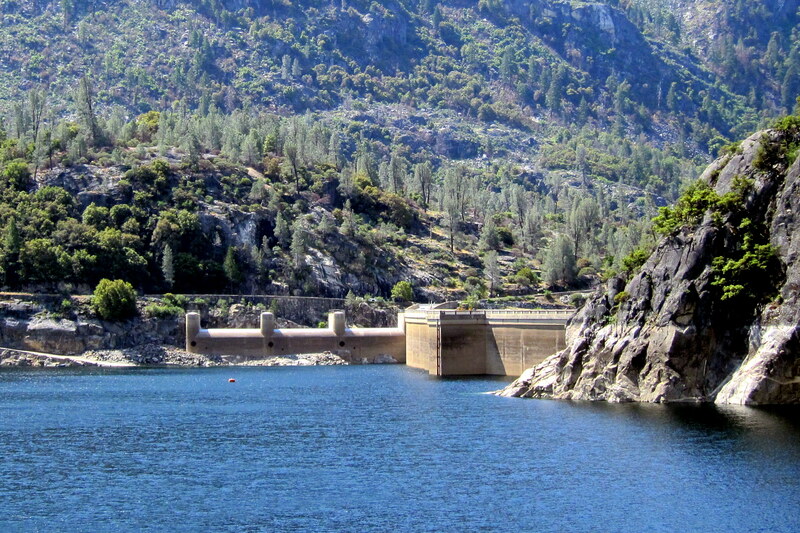 Meanwhile, Restore Hetch Hetchy (http://www.hetchhetchy.org). I agree, hope they can make it happen!